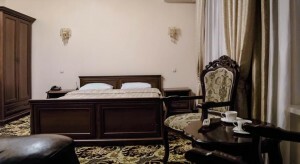 Offering a sauna and air-conditioned rooms with a flat-screen TV, Ajour Hotel is located in a green district Aksay 4 in Almaty. There is also a 24-hour reception. The rooms at Ajour feature classic-style décor and carpeted floors. All the private bathrooms have showers. Guests can have breakfast at the on-site café, drinks are offered at the bar. Several cafes can be found nearby. On-site relaxation is provided by the sauna, and massages can be booked at the hotel. Family Aqua Park is 10 minutes’ drive away. Ajour Hotel is within 10 minutes’ drive of the Family Aqua Park. Ulitsa imeni Ulugbeka bus stop is just 250 yards from the hotel, providing a link to Almaty Train Station. Almaty Airport is a 35-minute drive away.